Hummingbird Glasgow invited us into their Bath Street kitchens to watch Nora McMeekin make their delicious Pad Thai. From their new pan-Asian menu, this dish is a great example of the authentic tasting food brought from chefs who’ve cooked and learned techniques from across Asia. The special thing about Hummingbird’s Pad Thai is the ‘fixers’ you get to go along with it. 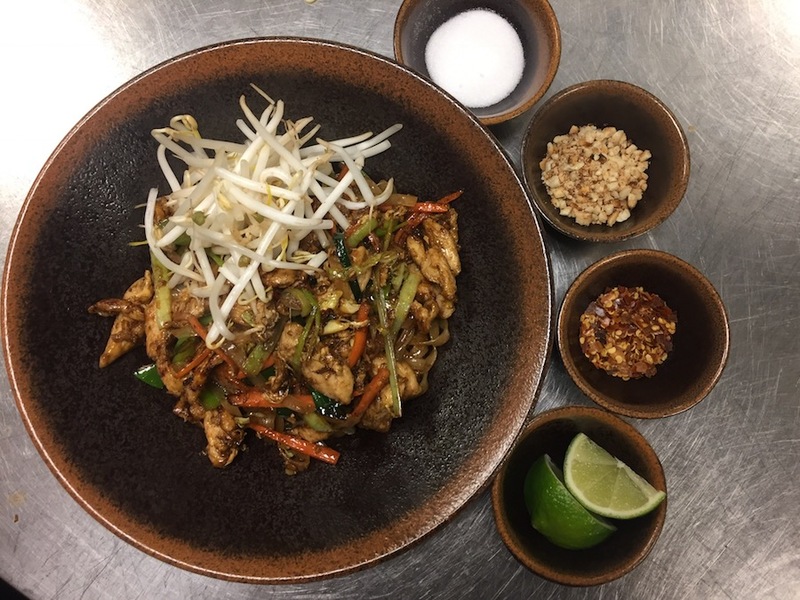 Peanuts, sugar, chilli, fish sauce and lime are all served with the dish so the diner can decide how to refine their Pad Thai according to their tastes. Like it to be a little hotter? Just add more chilli. More crunch? Add some peanuts! It’s a delicious dish to order in the restaurant plus great to make at home – just follow the recipe. Watch Nora make the recipe in the video and get the full instructions below. Fry chicken until golden brown and cooked through. Add garlic puree, then the egg and scramble. Add the noodles and vegetables then mix well. Add the sauce and continue to stir until dry and soft. Make sure not to use to use hot water for the noodles as they will over cook and you will get a soggy texture! Garnish with beansprouts on top and serve with condiments on the side also known as the ‘fixers’. These can be added to taste depending on your palate. If you like the look of this, you can try it a Hummingbird Glasgow with a 30% a la carte discount here on 5pm Dining.